Over $300 was raised to purchase a block of sea oats! On April 4, the Beaches Watch Board of Directors hosted the eighth annual Beaches Watch member social at the Beaches Museum & History Park. This year’s event was bigger and better than ever, thanks to the hard work of the Beaches Watch Board members, everyone who helped organize the event and the Beaches History Museum for the wonderful venue! We would like to thank everyone who joined us for the fun! In addition to the food, fun and socializing, we were extremely honored to also present the 2018 Friend of the Beaches award to Doug Brown. 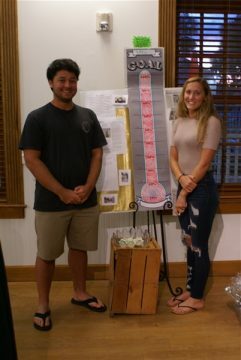 All funds raised from this year’s event supported the Beaches Watch Fletcher Senior Scholarship Fund. We look forward to awarding this scholarship to a deserving senior in May 2018! This year, we were also thrilled to host a special fundraiser for the Fletcher Marine Science & Service Club to plant a block of sea oats. Special thanks to our beer sponsor Anheiser Busch and wine sponsor GOS Wines International. We also want to thank all the amazing beaches businesses who donated over $1,600 in prizes for our raffle. Please thank these beaches businesses for their support by giving them your business!